This is the first of a series I’m going to be posting weekly on the subject of the River Avon and its connections with Shakespeare. 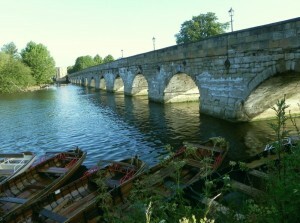 Clopton Bridge was built about 100 years before Shakespeare’s time by Sir Hugh Clopton, a man with local connections who became a wealthy merchant and eventually Mayor of London. Back in Stratford he spent a great deal of money on various building projects, the most influential of which was this bridge. It might not look very impressive to us, but this stone bridge made a huge difference to the town. The antiquarian John Leland, writing following a visit in 1530, described it as a “great and sumptuous bridge … with fourteen arches”. The town already had a weekly market, where people came from the surrounding countryside to trade goods, but before this bridge was built there was only a wooden bridge which became impassable when the river Avon rose. Leland explains that “Afore the time of Hugh Clopton there was but a poor bridge of timber and no causey [causeway] to it, whereby many poor folks and other refused to come to Stratford when Avon was up, or coming thither stood in jeopardy of life”. This substantial bridge made it possible for the town to become a thriving commercial centre where people could come to buy and sell goods. It also encouraged small industries like John Shakespeare’s gloving business to thrive. Travellers passing through would stay at one of the town’s many inns. Sometimes there would be more exotic visitors – during Shakespeare’s early years several professional acting companies on tour performed in Stratford. It’s even thought that this could be how Shakespeare got the theatre bug. Far from being a rural backwater, it was a busy place where Shakespeare would have had the opportunity to observe many people whose lives were very different from his own. All these people were brought here by Hugh Clopton’s bridge, and when Shakespeare left Stratford to go to London to begin his career as an actor and writer, the first steps on his journey were made over this bridge. This entry was posted in Shakespeare's World, Stratford-upon-Avon and tagged Clopton Bridge, Hugh Clopton, River Avon, Shakespeare, Stratford-upon-Avon. Bookmark the permalink. Yes as you say Stratford has never been a back water, the topography provided a fortunate position. The river represents the dividing line between the Southern “Feldon” or champion lands with it’s rich fertile soil and the Northern forest of Arden equally rich in timber and pasture. And there in between is the perfect place for a market to bring all this wealth together. The bridge is built over the remnants of the original Roman ford, so it has been the place to cross the river for at least 2000 years. Drovers would take their animals south to Banbury or London from Wales or the North passing through the town, so Shakespeare had a cavalcade of people to observe as they passed by, much as we do today in fact. It would be great to see what he would write today. Thanks for filling in all this extra detail! On July 18th 1588 a storm caused the Avon to flood and Clopton Bridge was damaged in the process, stranding people in the middle. This must have been the same storm which delayed the Spanish Armada from arriving off the English coast. Shakespeare may have remembered the storm later when writing The Tempest – see a short account of the storm in Stratford at http://findingshakespeare.co.uk/a-local-inspiration-for-the-tempest. Thanks for linking back to this post!